For one, when you buy locally grown produce you are investing in your own community. You are also helping small family farms compete. Locally-grown produce is also eco-friendly. The produce you buy at the supermarket is shipped an average of 1500 miles before it ends up on the shelf. Food that travels so many miles cannot be called sustainable. Plus, the taste of freshly grown local produce is impossible to beat! Luckily, vast numbers of Americans are already getting turned on to the benefits of buying local produce. But what do you do when the harvest is over, winter arrives, and local farms go into hibernation until spring? With a little old fashioned ingenuity and a few free hours to kill, you can continue to enjoy the benefits of local produce all year long. What makes this possible is a process known as home canning. The idea of placing food in a jar for preservation may seem a bit archaic to some, but the process is not difficult and the benefits are many. With a little planning you can prepare and preserve sauces, jams, and even pickles made from locally grown produce and enjoy them all year long! First Time Canning? Try Spaghetti Sauce! Spaghetti sauce is a great place to start for newcomers to the world of canning. Before you begin make sure you have a large supply of fresh tomatoes, canning supplies, a large pot, and an active imagination. Chop your tomatoes up and place them in the pot. Start cooking at a low to medium heat, adding mushrooms, garlic, onions, zucchini, peppers, eggplant, basil, herbs, and spices to the mix — whatever your heart desires. Be sure and add lemon juice to the mix, as it aids in the canning and preservation process. If you find your sauce is too bitter, add sugar to sweeten it up a bit. Experiment until you’ve found the taste you want. Be patient. Allow your sauce to simmer for several hours on a lower heat if you have the time. A crock pot is a sauce maker’s best friend. The canning process itself is actually quite easy. You can find easy-to-use glass canning jars and canning lids at most grocery stores. Once you have your sauce cooking, begin washing the jars and lids in hot soapy water. When your sauce is done, pour it into the glass jars while it is still hot. Be sure and leave a half inch to an inch of room at the top of the jar. Next, run a spatula around the interior surface of each jar to release air bubble trapped inside the sauce. Clean the jar’s rim, including any part of the glass that the lid will touch. Finally, screw the lids onto the sauce filled jars firmly, but without over-tightening. You now need to transfer the jars to a canner. 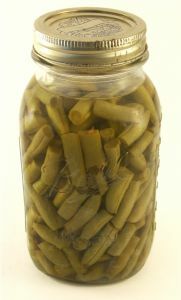 You can choose from a variety of commercially produced canners, or you can create a makeshift canner at home. If you choose the latter option you will need a large stock pot and a number of hand towels. Be sure and use towels that you don’t mind getting dirty or ruining, in case of accidental spillage. Boil enough water to submerge the jars by an inch or two. Once the water comes to a boil, place one of the towels at the bottom of the pot. Wrap the lidded jars with the remaining towels. Place them in the boiling water. The towels should prevent them from bumping into each other and shattering. You will want to keep an eye on the jars as they boil. Be sure and maintain the correct water level so they remain submerged in boiling water. The process should take about 30 minutes, a bit longer at higher altitudes. You can use a jar tong to remove the jars from the boiling water, or let the water cool before removal. Once the jars are out of the water, they just need to be left to cool. Once the process is complete, you can tuck your sauce away for future use on a cold winter’s day! Spaghetti sauce is a great place to start if you are interested in incorporating the unique flavors found in freshly grown local produce into recipes that you can enjoy all year long. Once you have mastered the art of canning, you can move on to new realms like making preserve out of locally-grown berries or pickling locally-grown cucumbers or beans. Canning is a fun project that can be enjoyed by the whole family! I’m a grad student studying political science. I’m passionate about environmental issues and sustainable living.